You are here: Home / Kayak / 5 Most Comfortable Kayak Seats: Your Posterior Will Thank You! 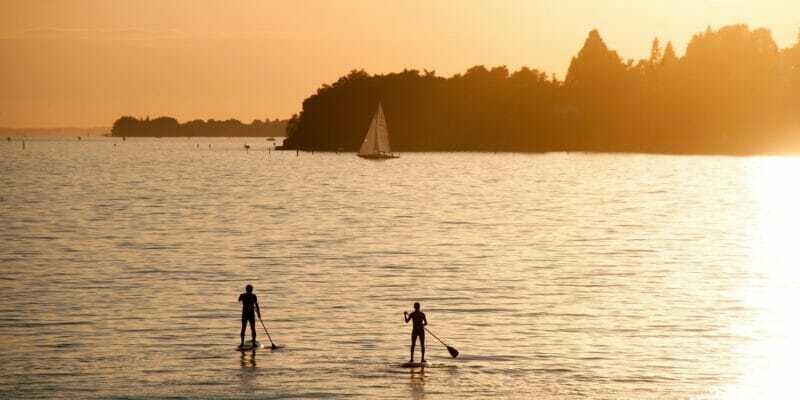 Have you ever gone out for a relaxing paddle in a kayak, only to return with an aching back, sore bum, and stiff legs? For many people, one of the most neglected parts of their kayak is a comfortable seat. 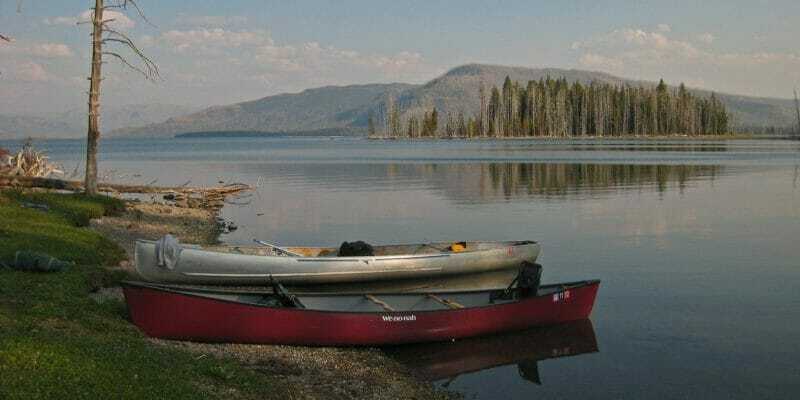 Many kayaks come with a low quality, thin seat – which leads to pain and less time kayaking! This fella might not need a kayak seat, but you might! To solve this issue, aftermarket seats have been designed to increase comfort and provide back support. There are a wide variety of kayak seats to pick from, which can make it a challenge to select the right one for you. I’ve taken a look at the some of the best kayak seats available and included a buyer’s guide to help you decide on the most comfortable seat for your kayak and body type. 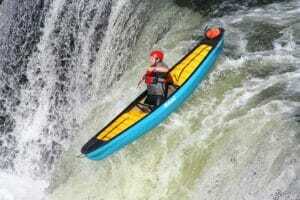 What to consider when choosing the best kayak seat? The undisputed champ for most comfortable kayak seat, the Surf to Summit GTS Expedition provides enough comfort and support to keep you kayaking all day long! The 2” thick seat bottom provides enough padding to keep your rear end from getting sore, while the 18” tall backrest delivers excellent lumbar support to keep your back stable. Constructed from a high-performance thermoformed foam blend, the seat is designed to be soft enough for longer trips, while still being firm enough to provide needed support. 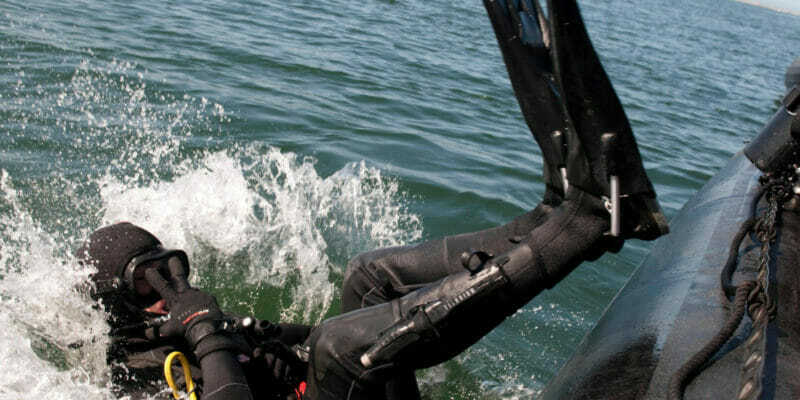 The rigging system uses a 6 point attachment design, which eliminates annoying “kayak seat slippage”. There are also deep drainage channels built into the foam to funnel away excess cockpit water. This keeps the seat from getting soggy. Designed to fit any sit-on-top kayak, this kayak seat will work well for anyone looking for a high-quality seat for longer kayaking sessions. 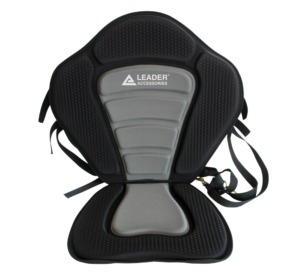 A great budget aftermarket kayak seat, the Leader Accessories Deluxe Kayak Seat is comfortable, versatile and won’t break the bank. Size-wise it’s on the larger side, so it works well for bigger and taller folks, or anyone looking for more back support. The design is similar to the GTS Expedition, with an 18” tall foam backrest that provides excellent lumbar support. The seat cushion is ½” thick, so it won’t be quite as comfy for those long kayak trips. The rigging system is highly versatile, with 4 marine-grade brass clips fastening the seat to either a sit-in or sit-on-top kayak. Overall, this seat is a great choice for anyone looking to replace their stock kayak seat without spending too much. 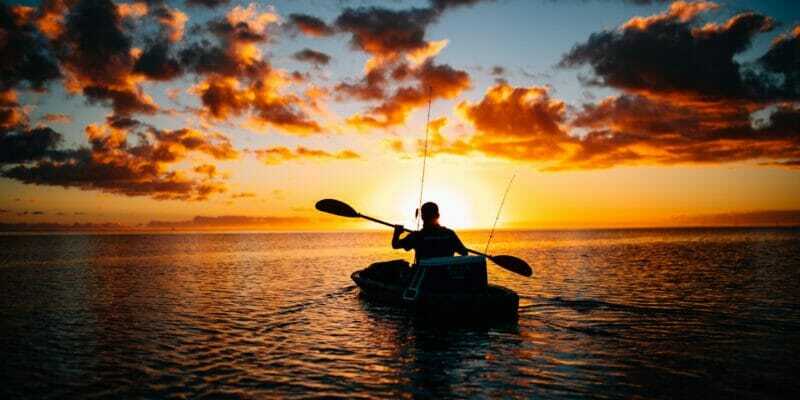 If you’re looking to catch fish from your kayak, a slightly elevated seat can provide you with a better position to cast from. The elevation also keeps your rear end high and dry, so rogue waves don’t drench you. The Surf to Summit Drifter is a great addition to any fisherman’s kayak. The seat pad is elevated 3” from the base, which is enough to keep you elevated and dry, but not enough to make the kayak unstable. Four mounting clips keep the seat fastened to your kayak, which is standard for most kayak seats. 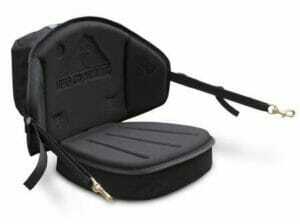 A detachable storage/tackle bag comes included with the seat, so you can keep important gear close by and secure. The seat back is 11.5” tall, which will provide some back support, but not as much as models with extra high backs. If you’re going to be seated in a kayak for long stretches of time, you’ll need a seat that’s comfortable and provides excellent back support. The Skwoosh Expedition is a superb option for longer kayaking sessions – as well as for people who want more back support. The 20” high backrest is reinforced with 2 fiberglass battens to keep it stiff, plus it has an adjustable lumbar support cushion to keep your back in the perfect position. 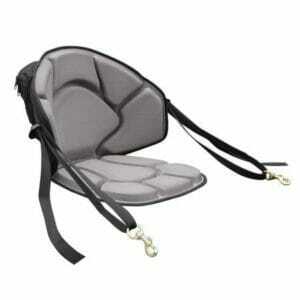 In addition to great lumbar support, the backrest has wings to supports all sides of your body. 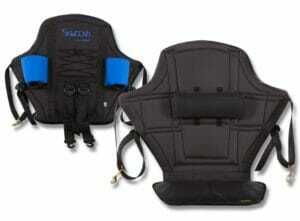 The seat cushion is 1” thick and made of waterproof fluidized gel so it’s low profile yet comfortable. Plenty of storage is provided with 2 water bottle holders and bungee netting in the rear of the seat back. Compact, ergonomic, and well-made are all words I would use to describe the Surf to Summit GTS Sport Sit-On-Top Kayak Seat. Made by the same company that manufactures several other top-rated kayak seats, this seat provides comfort and back support in a compact package. The seat back measures 12.5” tall. That’s not as tall as some other models, but nonetheless provides enough back support for most people. It molds around your back to keep you secure while allowing you more freedom to paddle without being hindered by too much seat. Construction quality is superb, with a mix of EVA foam, PVC plastic foam, and heavy duty 600 denier fabric used in various parts of the seat. There are deep water-channeling grooves throughout the seat and backrest, which quickly drain away any water you might encounter. 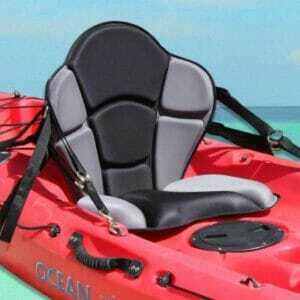 The seat will fit in any sit-on-top kayak, and many sit-in kayaks as well. Also included is a pack behind the seat for quick access to important items. Kayak seats can vary significantly in construction materials. There are two main materials used in kayak seats, Gel and Molded Foam padding. Gel is super soft and squishy and makes an extremely comfortable kayak seat to sit on, especially for hours at a time. It’s similar to the material used in mouse pad wrist-rests. The downside of gel is that it has a tendency to break down over time, and will need to be replaced eventually. Molded Foam padding is not as soft and plush as gel; however, a high-quality foam seat can last for years and put up with abuse, salt water, and heavy use. 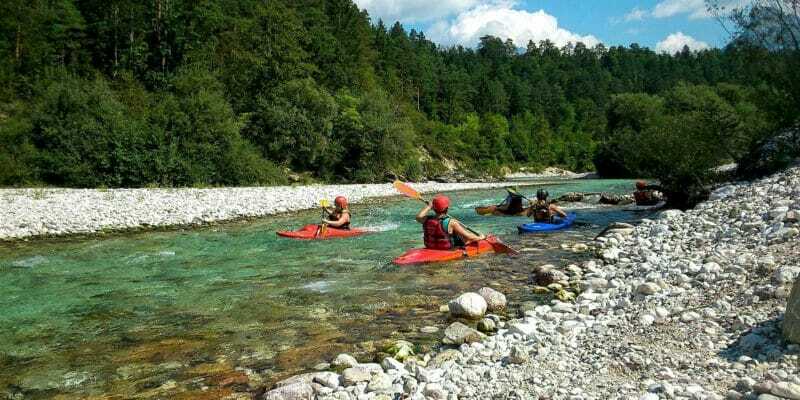 Thermo molded foam is often found in modern kayak seats, this type of foam is heated and molded to achieve a specific ergonomic shape. Foam seats will typically have water drainage grooves built in, which keeps your rear end from getting soggy! If you’re a casual kayaker, and only want the most comfortable kayak seat, then a gel seat is the best option. If you’re looking for a seat equipped to handle more serious kayaking and last a long time, then molded foam is the way to go. The most comfortable kayak seat for you is largely going to depend on your body type. Taller kayakers will need a higher seat back than shorter ones. Also, if you tend to get a sore back easily, a seat with good lumbar support will allow you to kayak longer without any back pain. A firm, high seat back is ideal for longer kayaking trips, as many people tend to slouch over when paddling for prolonged periods. This type of seat will keep your posture correct, and allow you to relax into the seat when you’re fatigued. A short seat back can be useful for smaller kayakers, or kayakers that want a more maneuverable setup. 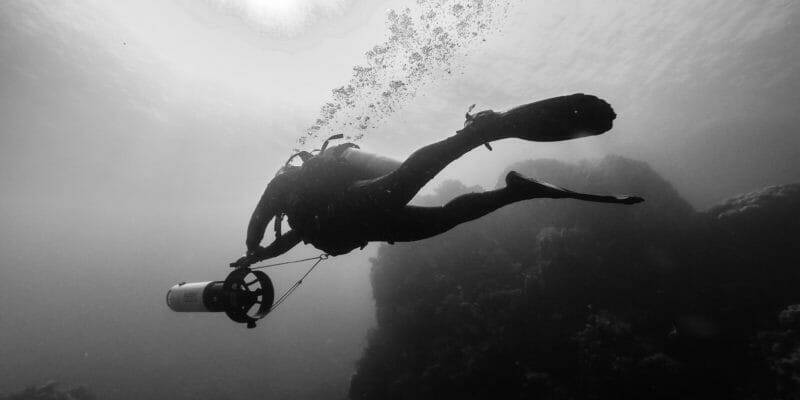 Shorter backrests allow you to paddle without becoming encumbered by any excess material. Also, if you kayak in tight spaces, you may find that a taller seat will get in your way. Some cool features to look for in a kayak seat are bottle holders, detachable packs and bungee storage areas on the back of the seat. While not crucial, many seats offer these extra storage options, which allow you to keep important items close by. We all know you can never have enough storage options on a kayak. Not all kayak seats will fit every type of kayak. Recreational kayaks, fishing kayaks, touring kayaks, and whitewater kayaks all have different dimensions available to install a seat. All the seats above are compatible with sit-on-top kayaks; however, sit-in kayaks may need specific sized seats. Before purchasing any seat, check your kayak’s measurements, and make sure the seat will be compatible. Attaching the seat to the kayak should be a fairly simple process. There are usually 4 clips which attach to the D-rings on the kayak’s hull. If your kayak doesn’t have these D-rings, or they are not in the right location, installing some D-rings with a drill is a fairly straightforward process.